Do You Support Jody Wilson-Raybould & Jane Philpott Crossing The Floor To NDP? If the Liberal Party Caucus votes to expel these two MPs, would you support the NDP allowing them to sit as NDP MPs until the end of the Parlimentary session. Not sitting as independents, but immediately sit as NDP MPs. Because right now the NDP does not accept floor crossers, even if they are expelled from their previous Party. Classic example is Maria Mourani, who was expelled from the Bloc. She ran under the NDP banner in 2015, but still had to sit as an Independent until Parlimentary session ended. Singh did admit he has been in contact with Wilson-Raybould, but declined to say what those discussions were. Having these two MPs in Jagmeet Singh caucus would send a strong signal to the Canadian electorate, and just add to Singh shine as a leader. But then again the NDP does have this rule of not accepting floor crossers under any circumstances. It would be hard to justify at any time, but particularly with only a few months until the election, and an opportunity to run properly under the NDP banner. Would you support your aunt becoming an automobile? I don't support floor crossing in any direction. It's still against NDP policy to accept floor crossers, isn't it? They're Liberals, whether or not they continue to caucus with the Liberal Party. That doesn't make them bad people, but if New Democrats are really now falling over themselves to welcome them into the NDP I guess that just further demonstrates that New Democrats are no longer my kind of people. I think the NDP's floor-crossing policy is a bad one. That said, I would not assume that JWR or Philpott are ideologically aligned with the NDP just because they're giving Trudeau a hard time right now. Why speculate on this, when we have no reason to think they WANT to join the NDP? Any evidence it was about crossing the floor? Following up as it is the most realistic post in the thread. Which aunt (on a scale of most favorite to least favorite) and would the car be electric? I'm having a conversation with you right now. That doesn't mean I'm a Liberal or about to become one. As usual you're engaged in diversion from the real issue, whether Trudeau and the Liberals acted inappropriately in dealing withWilson-Raybould and Philpott. As regards to their becoming NDP, its against party policy. If (a big if) they wanted to, they have the right to join the NDP and run for the NDP nomination in the upcoming election in their riding. If (a big if) they win the nomination, they have the right to run in the next election as NDP candidates. But you know all this. You want to divert from the problems the Liberals face on this issue and then call those who say they should be allowed to cross the floor hypocrites, further spinning out this thread and diverting us the real questions that exist now. As regards to their becoming NDP, its against party policy. But not in Alberta where a floor crosser was welcomed into Rachel Notley caucus. Which leads to another discussion as to whether the ties to the provincial and federal NDP should be severed, and make both levels independent of one another. This is the politics equivalent of the "If a dog wore pants..." meme. In fact it's not, the federal policy book has no rules on admitting MPs to the caucus, or expelling them, and the word "caucus" doesn't even appear in the book. Nor does the federal constitution specify any rules on how the caucus functions. It's a caucus policy. There is not a lot to say until either JWR decides to speak up or the ethics commissioner puts out a report. On floor crossing I think it should be permitted as it underlines that we are not electing parties we are electing MPs who are free to join and leave parties at will while remaining in office. The NDP would have to find new ridings for both to stand in in October: Neither of them currently holds a riding where an NDP gain is at all likely. It's not going to help Singh's chances of keeping any more of his caucus from standing down if he suddenly starts asking them to give way for two former Liberals. This hoopla around the idea of JWR or Philpott joining the NDP has the feel of mindless bandwagoning. "Look, the public is swooning over a couple of dissident Liberals! Let's get them on OUR side!" Reminds me of when that parliamentary page heckled Harper, and there was some movement to consecrate her as the go-to left-wing activist. Even had her holding up STOP HARPER signs during a provincial election in Alberta. Erin Weir has pointed out that with Celina Caesar-Chavannes leaving the Liberal party, there are now 18 independent MPs, the largest number in Canadian history. If JWR and Philpott are expelled from the Liberals, and they do not promptly join the NDP or Conservatives, that would push the number up to 20. When Erin was expelled from the NDP caucus the Speaker added an independent question during Question Period on Tuesdays, in order to provide one question per independent MP per week. Rather than trying to pigeonhole JWR and Philpott into another party I'd welcome the changes Erin is seeking to provide more speaking time for the burgeoning "Independent Caucus". With Celina Caesar-Chavannes leaving the Liberal caucus today, there are now 18 independent MPs, the largest number in Canadian history. For most of the current Parliament, there has been one weekly Question Period spot per independent MP. 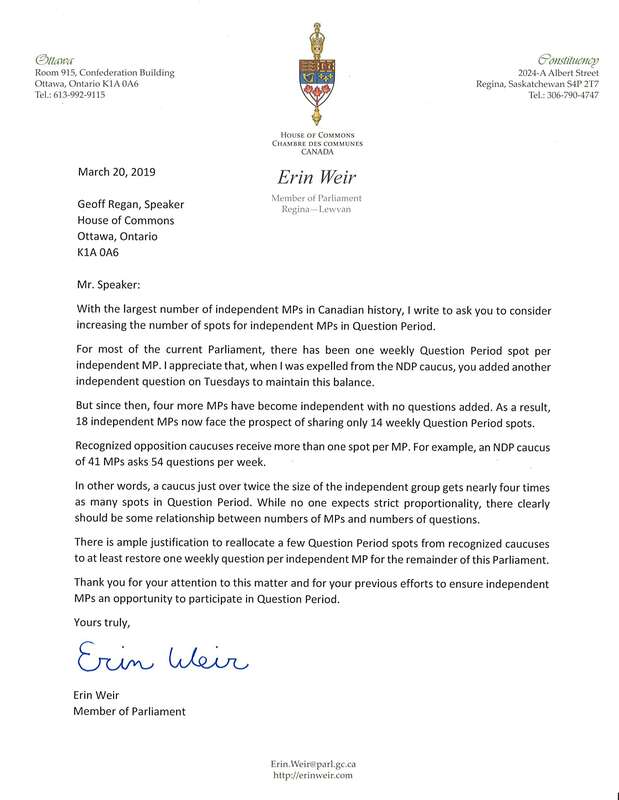 When the NDP leader unilaterally expelled Weir based on a deeply flawed investigation with no appeal, the Speaker added another independent question on Tuesdays to maintain one weekly Question Period spot per independent MP. Since then, four more MPs have become independent with no questions added. We now face the prospect of 18 independent MPs having to share only 14 weekly Question Period spots. By comparison, an NDP caucus of 41 MPs asks 54 questions per week. In other words, a caucus just over twice the size of the independent group gets nearly four times as many spots in Question Period. They are Liberals. That is what they are whether they are in caucus or not. When they are kicked out they are Independent Liberals. Let’s just leave it at that. If JWR ran as NDP in Vancouver-Granville she'd have no trouble getting re-elected. I don't expect there is much chance she will switch parties though. The Liberals won that seat by eighteen percentage points in 2015-and that was in B.C. one of only two provinces-the other being Saskatchewan-where the NDP gained ground as opposed to having a near-death experience, it's hard to picture it swinging into the Dipper column on JWR's personal popularity alone-besides which, who knows if she'll even still have her "political folk hero" status by October? For the NDP, trying to take Van Granville is pretty much like trying to take Van Centre. When Erin was expelled from the NDP [caucus - ed. by Unionist] the Speaker added an independent question during Question Period on Tuesdays, in order to provide one question per independent MP per week. Rather than trying to pigeonhole JWR and Philpott into another party I'd welcome the changes Erin is seeking to provide more speaking time for the burgeoning "Independent Caucus". Me too. Thanks for that link, robbie_dee. Harder. Provincial ridings within Van Centre have regularly elected NDP MLAs. Not so for Vancouver Granville, apart from a few slivers on the boundaries. It includes such NDP dead zones as Kerrisdale, Shaughnessy, and South Cambie. If you overlay a map of the cities richest neighbourhoods it becomes apparent why the NDP doesn't do well here. Rich people by and large don't vote against their own self interest, no matter how much their media likes to claim that Canada is a post-class society. CBC is reporting that many Liberals want to kick Wilson-Raybould and Philpott out of the caucus next week. They say if the issue is not on next week's caucus agenda, they intend to push to have it put on the agenda. CBC News has learned that MPs will discuss expelling the two women when they return to Parliament from their ridings next week. Some MPs who don't want to be identified say that if the matter of the two MPs' caucus status isn't on Wednesday's caucus agenda, they'll stand up at the meeting and ask their colleagues to vote on ejecting Wilson-Raybould and Philpott. Liberal MPs from all regions of the country tell CBC News they feel the two former cabinet ministers can't stay. "I've come to the conclusion that they both have lost any right to be a part of this team," Quebec MP Alexandra Mendès wrote in an email. She said serving in a party caucus requires "loyalty and team spirit." At an event in Halifax yesterday, Prime Minister Justin Trudeau was asked if he thinks the two MPs should be permitted to stay. "As for what Dr. Philpott and Ms. Wilson-Raybould intend to do as next steps, people are going to have to ask them," he replied. Because this is a trolling thread by a Liberal who wants to pretend that a conversation with Singh is about a topic he wants it to be about so that he can attack the NDP with it. This is another attack thread from the Liberal whose job it is to create these. Why feed the trolling behviour here whan it is this obvious? No evidence that the NDP is about to change its policy despite the hopeful Liberals here who want something to attack the NDP with. It's been a bad month for them. If this thread were at all honest it would speculate what they were talking about. The NDP could for example cooperate with them to help them in the House as a mutual interest thing. Crossing the floor not a topic worth discussing here. There appears to be more evidence of what they were talking about concerning SNC-Lavalin. According to CBC Wilson- Raybould recorded at least one conversation concerning SNC-Lavalin that has been submitted to the justice committee. Prime Minister Justin Trudeau has said Wilson-Raybould's exit from cabinet was a result of an "erosion of trust" between Wilson-Raybould and the Prime Minister's Office. The existence of a recording suggests that trust may have broken down well before she left cabinet on Feb. 12. CBC News asked Wilson-Raybould if she intended to submit an audio recording to the committee. "I have no comment," she replied by email. It is not clear which conversation or conversations were recorded. Why would any members of a socialist party want to recruit liberals. It is clear JWR wants to run for Trudeau's job when the opportunity arises not pretend she is anything other than a liberal. I have known colleagues who shared her views of the Liberal party being the progressive hope for our country. In the real world of politics those people are a minority in the Liberal party much like the socialist caucus in the NDP. Ms. Wilson-Raybould wanted to do politics differently – putting integrity & what's right for Canadians over what helps the Liberals. Today PM Trudeau & the Liberal gov't showed us exactly what they think about integrity. Thank you Jody for being loyal to Cdns. You deserve better. Jag definitely wants JWR to join the NDP! That tweet pretty much is all the evidence anyone needs. If she joins either the NDP or conservatives, I’m sure it would give that party a good solid boost that should pan out with a solid return come October. Jenny Kwan, speaking to reporters about the ouster, was asked point blank if the party is sending overtures to Jody Wilson Raybould. Kwan responds if Jody is interested, we (NDP) would be interested in speaking to her. Im about 88% sure that the NDP would toss their self imposed no floor crossing rule in 0.5 seconds flat if JWR wanted to join before October, say like May June? If she joined the conservatives, get ready for a conservative majority, and for sure she would be offered to be the ag! Even a minority conservative government would guarantee her a cabinet post. But to be fare, I’m sure if she joined the NDP and they formed government, she would still be guaranteed the same goodies as in the conservatives. Like a slow motion car pile up on a freeway in winter. If you steer just right you might make it through to the other side unscathed. Once in a while there is the exception like a Jack Layton, Rene Lesveque, Dave Barrett, Tommy Douglas, PET, maybe a Frank Howard, or possibly a Judy Wilson-Raybould, but overall, not a very impressive group. Who else would you like to try and smear tonite?